Dine a Chook is a Proud Australian family-owned company. We are committed to providing the Best in Quality Products for BackYard Chicken Keepers. We manufacture the Dine-A-Chook Feeders to be better than other Feeders. Being Chicken Farmers ourselves, we have addressed the flaws in other Feeders so ours is the Best. When you purchase a Dine-A-Chook Chicken feeder, you are getting the Best for performance and durability. Before we get onto the type of feed and installation, you should be proud of yourself for buying a Dine A Chook Feeder. The waste reducing feed hopper will start saving you money instantly. No more wasted chicken feed on the ground. It will also help rat proof your chicken coop. No feed on the ground means less attraction to rats and rodents. What is the best Chicken Feed for use with a Dine a Chook feeder? Many customers choose mixed-grain to feed their backyard poultry. This is usually cheap in price and looks good in the bag. The reality is that this contains a variety of a grain. This also means your Chickens pick out what they like and waste the rest. So while this seems like a Cheap feed, it actually can be more expensive in the long run due to wastage. Feed Stores recommend it because it means you keep coming back for more. Because your Birds have been picky and selective, they may also be missing out on essential nutrients for a healthy, well-balanced diet. Chickens are like children. They eat their favourite parts of the mix then scatter the feed on the floor while picking out what they like. They then go searching for something else because what is left in the feeder isn’t to their liking/ Meanwhile the scattered feed on the floor rots and attracts vermin. 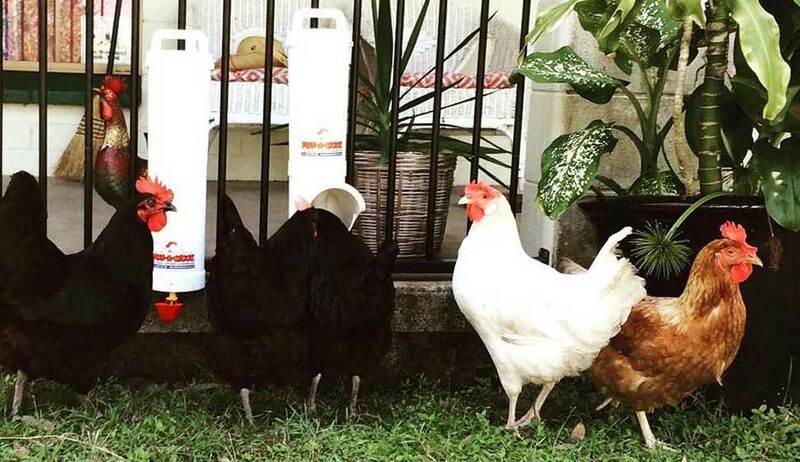 Dine a Chook Waste Reducing Chicken Feeders are most effective when used with a crumbed or pelleted feed. While these feeds might not look as appealing, they discourage selective feeding. Made to give your chickens the nutrition they need. This will not only save you money on wasted feed, but it may also help rodent-proof your pen! How do I to install a Dine a Chook No Waste Chicken Feeder? Installing your Dine a Chook Feeder is easy. Everything you need to mount the feeder in almost any situation is supplied in the complementary Dine a Chook Mounting Kit. The Dine a Chook Chicken Feeder has 3 moulded rear hooks. Only two hooks are required to mount the feeder. We suggest the top and bottom hook. These hooks are used to mount the feeder directly in many modern chicken coops,. You may need a timber or steel post to secure into if the wire mesh or other support is not strong enough to hold the feeder. If you cannot mount your Dine a Chook Waste reducing chicken feeder using the mounting hooks, we have provided a Mounting Kit containing steel brackets and screws to suit any situation. The steel brackets are custom-sized to fit the mounting hooks on the body of the feeder. Screws can be used with a standard drill bit to fix the brackets to either wood or metal surfaces. Hold the brackets onto the top and bottom mounting hooks and situate your feeder at the correct height. Mark the bracket locations, or simply hold the top bracket in place and remove the feeder. Screw the bracket into place and repeat with the second bracket. That’s it, your Dine a Chook Feeder is ready to go! How high off the ground should my feeder be? Our feeders are designed to be mounted at “chicken height” for best results. This allows the patented design to prevent spillage and may also deter rodents, mice and wild birds more effectively, helping to vermin-proof your chicken coop. Obviously, chicken height will vary depending on breed. We recommend the feeder be mounted level with the back of the bird's neck in order to allow comfortable feeding - this will be somewhere between 100 and 150 mm above the floor. In flocks of different breeds, you need to mount the feeder so it is accessible to the smallest bird. In such cases, a second feeder mounted for larger birds is recommended. If you find that birds struggle to access the feeder, it may need to be lowered by 1-2 cm. If you have a severe rodent infestation, we recommend that you install your chicken feeder above chicken height and provide a “step” for chickens, such as a brick of block, to allow them to access the feed. Where should I install my Dine a Chook Chicken Feeder? Although Dine a Chook Feeders are designed to be as water-tight and weather-proof as possible, we recommend installation in a sheltered area where practical. Installation inside the chicken coop rather than in the run or yard will ensure that feed is better protected from rain and weather. If installing in a position that will receive heavy rain, do not worry. My 3 feeders constantly cop heavy downpours here in North Queensland. I am always happy to see how effective the rain gutter is. Mind you, I did spend many hours perfecting it! How often do I need to fill my Dine a Chook Feeder? The amount of feed consumed by your chickens will determine how often your feeder needs to be refilled. As a general guide, our 3.5 Litre Feeder will feed 4 chickens for 4 days, while our 4.7 Litre Feeder will feed 6 chooks for 4 days. However, the amount of feed consumed by your chickens will vary depending on their age and breed, as well as the time of year, so you should check your feeder regularly until a feeding pattern has been established. How much feed should be in the feeder? Dine a Chook Chicken Feeders will function perfectly well no matter how little or how much feed is in them. Now go and enjoy watching your chickens enjoy their brand new Dine A Chook Automatic Waste reducing chicken feeder.